Lower Price! Shopkins Season 6 Chef Club Just $10.79! You are here: Home / Great Deals / Lower Price! 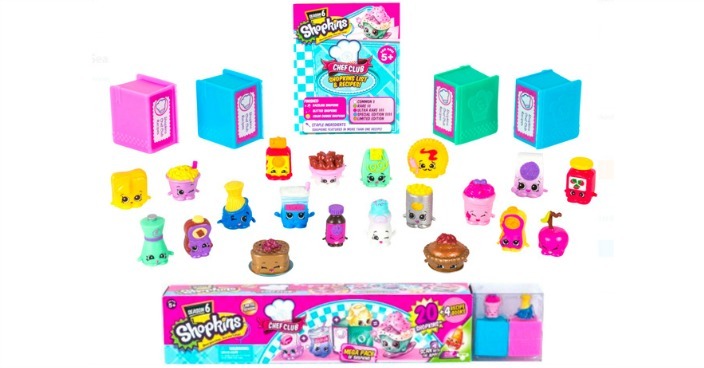 Shopkins Season 6 Chef Club Just $10.79! Right now you can get this Shopkins Season 6 Chef Club for just $10.79 at Walmart! Cook up a Shopkins banquet in an instant with the Chef Club Mega Pack! This box is choc full of 20 Chef Club Shopkins and four recipe books. This season each Shopkin is an ingredient in a deliciously fun recipe! Collect all the ingredients and search for the Limited Edition “Finished Dishes!” There are breakfast meals to make, sweet things to bake, family foods to prepare and baked goods to share! The perfect way build up your collection and start cooking quick!